We need energy. The pillars of modern society and the global economy are built on it. We generate it from multiple sources and consume it on an unprecedented scale. In 2017 alone, humankind consumed more than 20,000 TWh, twice as much as in 1990. However, in the same year, almost 79% of energy came from irreplaceable fossil fuels. This is why we need more energy from renewable sources. In the last few decades, there have been countless projects aiming to increase the share of renewable energy in global energy consumption. This effort has paid off. We are much better at generating “green” energy than 20-30 years ago, and that brings benefits. In 2016, more than 10% of energy consumption was covered by so-called modern renewables (including energy generated by wind, solar, biomass, geothermal, ocean & hydro sources) . What is more, the average 10-year growth rate of modern renewables at that time increased by 5.4%. The role of “green” energy is continually growing. In countries like Denmark, modern renewables have became a crucial source of energy for the grid (in Denmark renewables account for almost 60% of total energy generation, in Uruguay the figure is 30%, in Germany 28%). 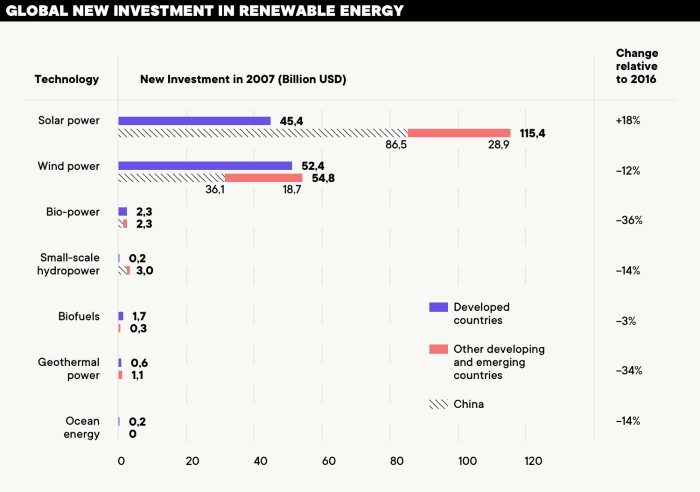 This growing share of renewable energy is an effect of the heavy investment over recent decades. 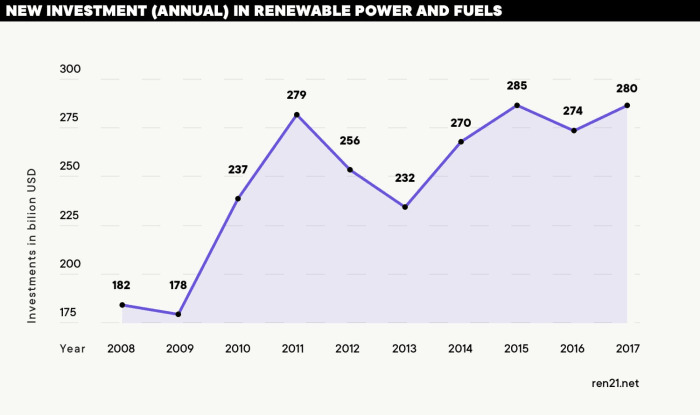 In 2017, new investment in renewable power and fuels reached $279.8 billion, rising from $181 billion in 2008. A fair share of that investment was targeted at solar power ($161 billion) and wind power ($107 billion). 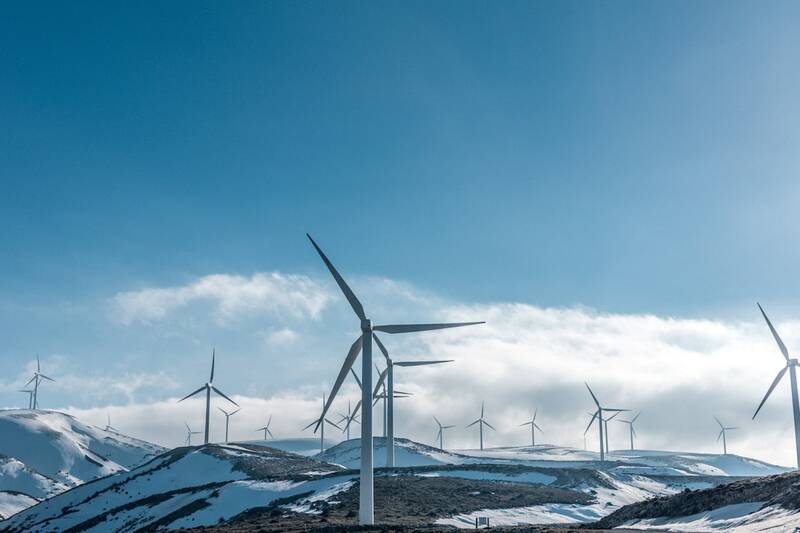 One tangible effect is the increase in size of the renewable energy market which, according to Allied Market Research, is worth $1,469,078 million and will have grown by about 50% by 2025. And this optimistic forecast for a renewable energy industry can come true with the help of digital transformation. Generating energy from renewable resources is a challenge in light of the need to manage multiple and decentralized sources. Additionally, the industry faces complex challenges in the form of power delivery and quality, identifying new revenue sources, and improving asset level visibility as well as issues connected with cyber security, and implementing and integrating new technologies – the list of factors is long. All these issues raise the need for digitalization which can push the industry further and boost the generation and distribution of green energy. But how will “digitalization energy” help? We can easily add to this list of improvements life extension for power plants and networks, lower network losses, lower O&M costs, and many more. All of this can be achieved by implementing and using high tech. How? Generating, managing and distributing energy is more than ever a matter of gathering, processing and using carefully selected data to optimize processes and resources. That is why energy companies invest heavily in the digital electricity infrastructure and software. In 2016 alone, they spent $47 billion on this, 20% more than the year before. Among the many digital solutions being explored, two cutting-edge technologies are at the top: IIoT and AI. Thanks to the development of the so-called Internet of Things, the renewable energy industry can collect enormous sets of essential data. 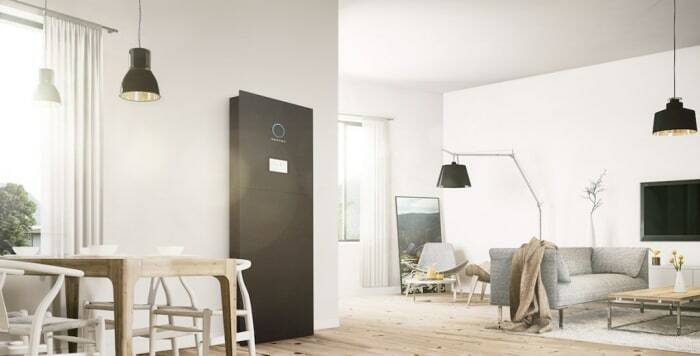 Smart meters and smart grids, packed with sensors to collect data related to diagnostics, maintenance and the health of assets, are a great example of exploring the possibilities of the Internet of Things with renewable energy sources in mind. Also, thanks to IoT devices in smart homes and smart buildings, companies can better recognize consumer needs and monitor real-time energy consumption in order to optimize energy transmission. However, collecting raw data is not enough to make a meaningful change. This is why the renewables industry uses the powerful possibilities of AI. Advanced AI algorithms are used to analyze data, build forecasts models and even act autonomously, if necessary. Artificial intelligence can be used in many areas relevant to the renewable energy industry. One of them is energy storage. AI is used to improve storage efficiency. For example, The Stem company uses AI to map energy usage and track fluctuations in energy rates for more efficient storage. Another example of AI use is the case of DeepMind, which helped Google to control temperature and power consumption in their data centers to increase efficiency. 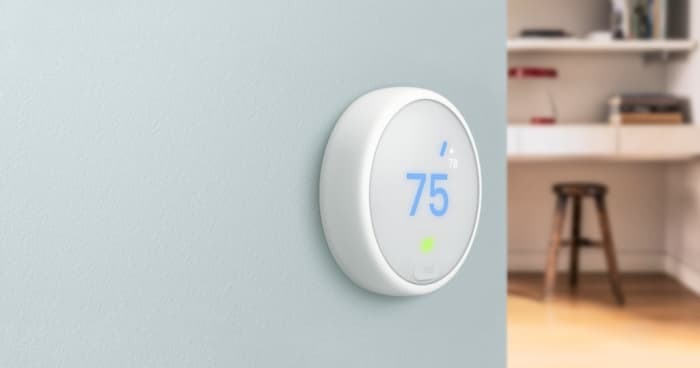 Also, Nest, owned by Alphabet, is an excellent example of using AI to monitor the energy consumption behavior of individuals and businesses via smart thermostats. Artificial intelligence can also be used to forecast weather and atmospheric conditions, including the amount of hourly photovoltaic energy that will be produced at power plants. Why is this so important? Because weather conditions impact the power that can be generated from solar or wind sources. This is why Spanish company Nnergix pools data from the energy industry, combines it with satellite data, and uses machine learning to make more accurate forecasts. These are just a few examples of using artificial intelligence in renewables. Beside the IIoT and AI, many other digitalization solutions are having a positive impact on the industry, including platforms for asset management, logistics management, and improving communication and workflow efficiency for employees. 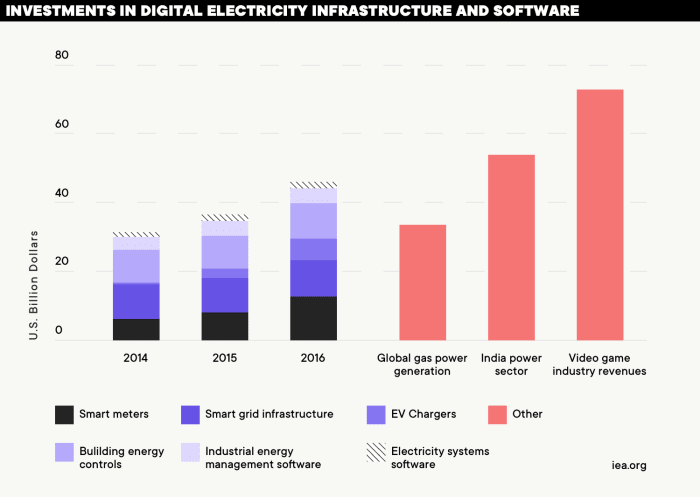 All of these are part of the digital transformation changing the renewable energy industry. The global consumption of energy is growing, and according to the U.S. Energy Information Administration (EIA), it won’t change in the near future. The EIA forecasts that global consumption of energy will grow by 28% by 2040. However, according to McKinsey, by 2050, almost 26% of energy will come from renewable resources, and notably, 7% will come from wind and solar. This is a great opportunity for companies from both the “green” and “traditional” energy industries to seek advantage from digital transformation to meet the power and energy needs of the future.